A Colorado man who has been “fighting with his computer for the last several months” unloaded a volley of shots into his Dell tormentor, resulting in the death of the computer and him being cited for discharging a firearm, cops report. When asked about the shooting, Hinch told TSG, “I just had it,” adding that he tired of the balky computer’s “blue screen of death.” Hinch said that he whacked the computer with a 9mm Hi-Point pistol recently purchased from a Craigslist seller. The gun was seized by police, who left the computer behind. 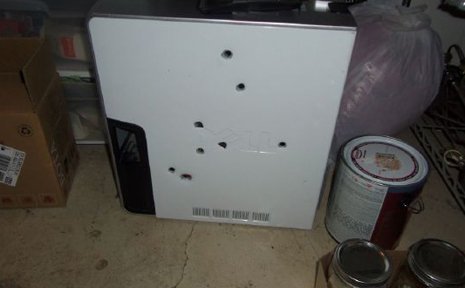 The late Dell XPS 410 model, seen in the above police evidence photo, is survived by a monitor and a keyboard. Hinch, pictured above right, clipped his computer behind the Colorado Springs residence he shares with his girlfriend (and from which the couple operates a homeopathic herb store). Hinch is scheduled for a May 11 court hearing on the misdemeanor charge.